On a quiet Saturday morning, Chinatown-Intentional District is slow to wake up. The sky is a saturated electric blue, broken up by one unimpressive wispy cloud that’s sure to dissipate within the hour. Bits of scattered light contrast the long shadows of a quickly rising sun, giving each brick of the East Kong Yick Building a multihued dimension that can only be witnessed at the very beginning and the very end of a sunny day. Spring is imminent, but winter is putting up a fight. It is bitterly cold. Dean Wong saunters his way down a long back alley with a cup of coffee in one hand and a large plastic bag of Origami cranes in the other. He stops upon reaching an unassuming red storefront covered in worn but intact cranes. He extracts his cranes from the bag one by one, carefully positioning each on the wall among the others. There’s a photograph of a man wearing a khaki shirt in the top right corner with a caption that reads #JusticeForDonnie. This is where the story of Wong’s lifelong friend, the community activist Donnie Chin, begins: in Canton Alley, a place that looks like any other alley but that is really anything but. 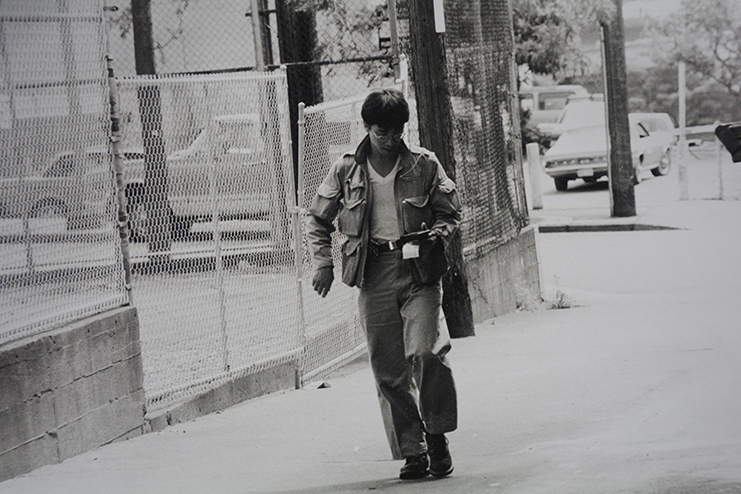 Chin was killed in 2015 while on one of his patrols, something he’d done in the Chinatown-International District (CID) since childhood. In May, he will posthumously receive the Bob Santos Leadership in Sustainability Award from the InterIm Community Development Association (CDA), an organization that was long-helmed by community leader Bob Santos and which now provides multilingual housing and community-related services to APIA immigrant and refugee communities in Seattle. His sister, Connie Chin-Magorty, will accept the award on his behalf. Donnie Chin. Photo by Dean Wong. The Chin siblings and Wong grew up playing and helping their families run businesses in the CID, or “getting into trouble,” as Wong puts it. Wong’s mother ran a laundry cleaner not far from the Chin family store, the Sun May Company, which first opened in 1911 and is now run by Chin-Magorty in Canton Alley. Longtime InterIm CDA board member Gary Iwamoto believes that this award brings the story full circle: Donnie’s father, Don Chin, was a respected merchant and started the Seattle Chinese Chamber of Commerce in 1963. He was also on the original Seattle Model City Program board that started InterIm. “That’s where Donnie’s introduction is – his sense of community was passed down from his dad,” says Iwamoto. In the 1960s and ‘70s, the police and fire departments were slow to respond to calls from the CID, explains Chin-Magorty. Many of the local residents were elderly former workers who had come to the U.S. from Asia to work in fish canneries or as cooks to send money back home to their families. “Being down in the CID all the time as kids, we’d see them every day, and if we didn’t see someone for a few days, Donnie would go check on them. Some of the people didn’t have food, so Donnie would buy canned food and pass it out,” she remembers. Twelve-year old Chin started to identify seniors in the community to visit regularly, taking it upon himself to conduct welfare checks, sometimes bringing a case manager or a nurse with him. He wanted to learn how he could help them if they were physically hurt, too, so he and Wong learned first aid. Together with Connie, the three of them started the Eagle Club in 1968, the first iteration of what would become the International District Emergency Center (IDEC). Around the time that Bruce Lee’s Return of the Dragon was released, Wong’s marker of time, they began doing neighborhood patrols and setting up first aid stations at public events. Chin and Wong cleared out the Canton Alley space and made it into their emergency center. They painted it all black, maybe because Chin “was going through a dark phase,” jokes his sister, and the police didn’t know what to make of them, shining their flashlights in only to find two Chinatown kids wearing bright red and yellow jumpsuits with long hair staring back. Stationed in Canton Alley, Chin noticed that working families would leave their young children locked in their apartments all day. He offered to look after them and feed them what he ate, mostly army surplus items. As the kids grew, he taught them first aid and the importance of serving one’s community. Many of those children went on to become doctors, nurses, teachers, and counselors in and around the community, following in his footsteps. Over the years, Canton Alley became a place to congregate. Chin was famous for his liberal use of profanity, which yes, Wong admits with a wry smile, was passed along to some of those kids. He also held barbecues in the alley, a way of informal networking in the community. 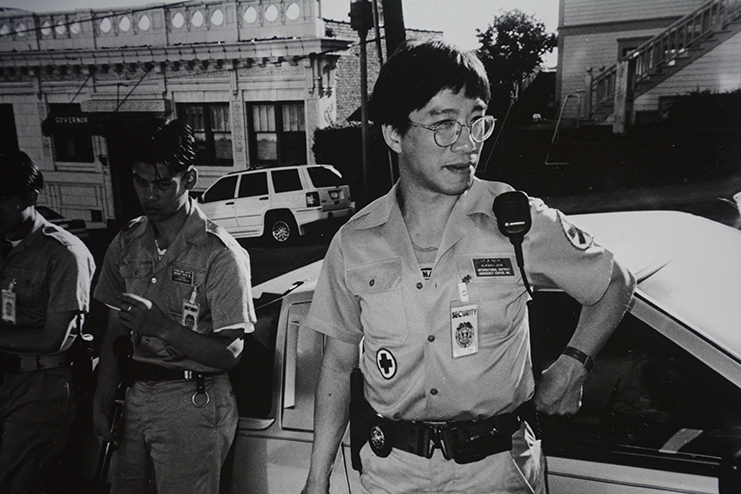 In the 1970s, Chin developed a friendship with Dr. Michael Copass, the first Medical Director of Medic One and the longtime Director of Emergency Services at Harborview. Copass once ‘liberated’ a fire department radio for them so that they could listen to local scanners. Though never a paramedic, Chin was close to the fire department, always first to arrive at a scene to help navigate the department through buildings quickly and safely. He would be offended when a new recruit didn’t know who he was, says Wong. He was even asked to join the paramedic group, but Chin always felt he could do more on his own. He wanted to be available 24/7 on the ground. At one point, Chin instructed a session of the paramedic training program, teaching first aid from his perspective. Anything that came up in training, he had already dealt with in real life patrolling the neighborhood. Donnie Chin will posthumously receive the Bob Santos Leadership in Sustainability Award at InterIm CDA’s annual gala and 50th anniversary celebration, held on May 4. For more information on the event and to get tickets, visit their website.